Terri Schiavo died this morning. I haven’t commented on this before because I could never understand how a court could allow her welfare be decided by her estranged husband – a man who is living with another woman and had children by her. Even so, I have to admit I would not want to live in the condition Terri was in. But for the record…I don’t want to die by starvation either. What is it with liberals and fraud? First there was Rathergate where a known Bush hater supplied CBS news with memos he claimed were from a former commanding officer of George W. Bush. My favorite justification of that fiasco was that the memos were “fake but true”. Last week, ABC News reported that a memo circulated by Repulicans was trying to exploit the Terri Schiavo case for political gain. Powerline again blows up another liberal lie by demonstrating that memo is also clearly a fraud. It wasn’t written by Senate Republicans. Since those frauds were so successful, the liberal group People for the American Way apparently thought they would follow those examples. They don’t want U.S. Senate Republicans to be able to confirm President Bush’s appellate court judge nominees. For four years Senate Democrats have been using filibusters to prevent the nominees from coming to a vote. This means that effectively there must be 60 votes to confirm a judge instead of the simple majority (51) required by the constitution. Senate Republicans want to prevent the filibusters by changing procedural rules. I’m a Republican. A common sense Republican. I like that my party controls the White House and the Congress. But I also know that our democracy works best when both parties are speaking out and being heard. Here’s where it gets funny. Radio Blogger did a little research into finding out who this “common sense” Republican is. It turns out he doesn’t hold any elected public office. He isn’t a prominent businessman either. His name is Ted Nonini and he is the treasurer of the United Firefighters of Los Angeles City. Yep, he is an officer in a union. That is, he is an officer in a union that endorsed John Kerry in last year’s election. Do you really think an officer of an organization that supported John Kerry is really glad that Republicans hold the presidency and majorities in congress? Please. I updated my blog roll to the right. Way overdue to add Melissa to my list. Obviously there isn’t a lot on TV tonight since I’m sitting here watching the Colorado Mammoth lacrosse game. The more I watch, the more I believe lacrosse is the game for guys who like hockey but don’t know how to ice skate. This is a dare, not permission, DON’T DO IT! Picture012.jpg, originally uploaded by semperjase. 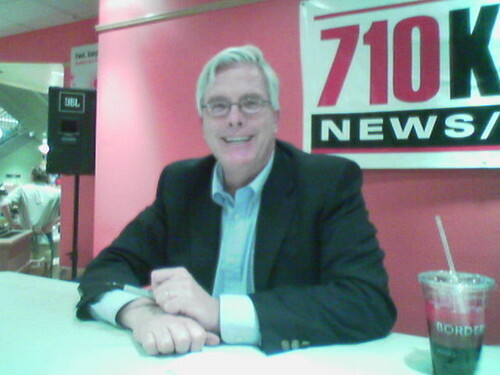 Last night Hugh Hewitt was in Denver for a book signing. Of course I had to go to get my copy of Blog signed and shake hands. Honeybun snapped this pick. I’m never washing my hand again. A legislator in Maine has introduced a bill to prohibit the aborting of fetuses that would grow up to be homosexual. Even though it is impossible to tell right now which lifestyle the fetus would choose in life, this is a pre-emptive measure for the day when science may be able to predict such behavior in the womb. So-called women’s groups want no restrictions on abortion while homosexual activists want societal promotion of their lifestyle. Who wins here? If the bill were to pass, Maine is saying that homosexuality is superior to heterosexuality since on heterosexual babies could be aborted. Presumed heterosexual babies would not have the same protection as homosexual babies. Putting aside morality, it is difficult to understand the legality of such a move. Then again, maybe this legislator is smart. If the law were to stand up against legal challenges from abortionists, it would necessarily outlaw all abortion since the heterosexual babies obviously deserve the same protections as homosexual babies. It’s been over a week since I last posted. Hey, I’ve been busy. No, really. I’ve been working a project for school. This semester is web design so I’ve been, well designing. My web site is devoted to science-fiction and fantasy books. You can see the results so far at www.sffnexus.com.